Colorkitten's Action Blog: ikea to the rescue!! I love that they have their own little space. Both of my kids (ages 7 & 4) love tents/igloos. My son (named after your Evan) has a plastic igloo that he and his sister play in outside (when we have snow). I sewed 2 tee-pees a couple of years ago that the kids play in indoors & out. There's something cozy and inviting about a small space like a tent. Incidentally, I found the coolest fabric today. I'll post a picture of it on my blog. 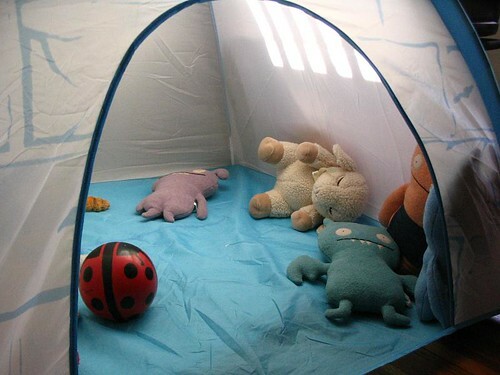 Before I had my own little bundle'o'fun, I bought the Ikea Igloo as a belated bday gift for a friend's son (By the time he got it, he was almost 1 and half!) I realized after I brought it home, that it said 3+ on the package. I gave it to her anyway, with apologizes "if it was an inappropriate gift" She laughed, and set it up. Huge hit! He takes his snack in there, and everything. For the price, new toddler gift for everyone now! Ha! I too am guilty of the pre-motherhood baby gift that was a little unsafe....it all works out though. I am definitely keeping the igloo in mind for future baby gifts! It's too cute! !